What do you do with two long-standing detective partners who just can't get along? Well, you send them to couples counseling of course! That's the premise of USA Network's new drama series Common Law. Travis Marks and Wes Mitchell have a great track record for closing cases. After making their mark on LAPD's Robbery and Homicide, they're entering the stage in their relationship when getting along seems like too much work. To preserve their careers, their captain sends them to couples counseling in order to work through their issues and hopefully put them back on track. Now, you might think this is going to be some touchy-feely, 'we find our friendship again and everything is perfect' kind of situation, but it's not. These guys might be good cop partners, but they've got so many problems to work through that they'll likely be in therapy for years. Wes used to be a lawyer, but circumstances led him to become a cop instead. He sacrificed his former, less dangerous career along with his marriage in order to pursue this new life path. Well, maybe the OCD played a bit into his marriage disintegration, too. You see, Wes is a bit particular about...well, everything. And the way he unwinds is by watering his ex-wife's lawn, technically half still belonging to him. Yeah, they share custody of the yard. It's a thing. His partner, on the other hand, is more off the books. Travis used to be a juvenile delinquent and now he's working this side of the law. He has no trouble getting a date, but he does have trouble keeping them. His upbringing caused him to have issues with commitment, intimacy, and abandonment. Oh, and he also has a problem with discharging his weapon. That's gotten him into trouble a few times and is bound to keep happening. Like I said, they've both got a multitude of problems. I have a love of buddy cop dramas. One of my favorite shows remains Starsky and Hutch, I never missed a week of Due South, and I'm an avid viewer of White Collar. So, going into this, I'm in the mindset of this being a show about cops who were friends and just having a rough patch. It's not quite like that. These guys tolerate each other, but they don't seem to especially like each other. And, as we saw with a particular scene of Wes meeting one of Travis' foster brothers for the first time, they've never really tried to get to know each other on a deeper level. They do their jobs, they leave work, and they don't interact until they have to see each other again. It's not the typical set-up that buddy cop dramas usually revolve around. However, that's what makes it fresh and interesting. We as an audience get to discover all the layers to these two guys, just as they're doing it themselves. It might stretch the imagination at times, leaving us wondering how it's possible that they didn't know particular things about each other, but I think by the end they'll both be stronger for it and perhaps even be closer? That's my hope. These two partners are great at what they do and I'm excited to see them figure out how to work together without tearing each other apart. 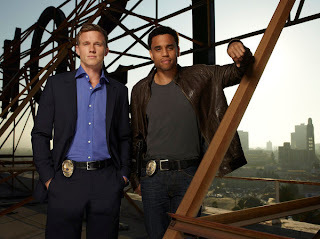 Common Law has been scheduled with a 12-episode run and stars Michael Ealy, Warren Kole, Jack McGee and Sonya Walger. It premieres on the USA Network on Friday, May 11th, at 10PM. If you're a fan of buddy cop shows, be sure to check this one out!